If you’re like me, you’ve been clinging to your old home theater receiver for too long. I’m continually tempted by all the features and connectivity that newer models offer. 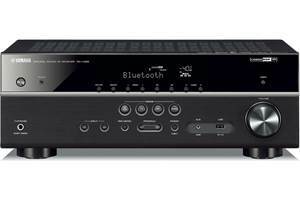 I just always liked my 7-year-old Yamaha receiver and have been hesitant to upgrade. But after a recent Yamaha training event here at Crutchfield, I was impressed enough to take their RX-A2020 home for a test drive. 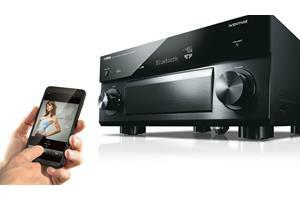 The RX-A2020 sits near the top of Yamaha’s receiver line, between the RX-A1020 and RX-A3020. It offers a whopping 140 watts per channel in stereo mode, 9-channel output with 3-zone capability, and a host of connections and features. Weighing in at a hefty 37.7 pounds, the RX-A2020 is rock solid. It has a reinforced chassis as well as an extra-large power supply delivering clean, stable current. Its high-quality construction is designed to minimize signal degradation and deliver music and movies with detail and accuracy. I auditioned the RX-A2020 with three sets of speakers, starting with the Polk Audio TSi series. I connected the TSi300 floor-standing speakers as fronts, the TSi CS10 center channel, and TSi100 bookshelves as surrounds. The Polk Audio PSW108 served as my subwoofer. For sources, I used my LG HDTV, Sony BDP-S1100 Blu-ray player, and my satellite TV receiver. A word of warning: this receiver, like many others these days, does not ship with a manual in the box. Instead, it includes a CD-ROM with an electronic copy along with printed quick setup instructions. I recommend leaving the disc in the box and going to Crutchfield’s website, where you can download the manual from the Details tab of the product web page to your laptop or tablet. Once I connected everything to the RX-A2020, I turned it on and proceeded with the setup. Yamaha’s on-screen guide is attractive, colorful, and easily navigable, particularly compared to receivers from just a few years ago. The “On-Screen” button on the remote brings up an icon-based toolbar on the left side of the screen. This is where you’ll find most of the receivers advanced settings. There’s also an “Option” button that opens up a small overlay for quick adjustments like tone controls for bass and treble. Typically, the first thing you do when setting up a receiver is run the automatic speaker calibration. But with the RX-A2020, your first order of business should be configuring the “power amp assign” feature. This tells the receiver what speakers are connected to which of its 11 powered outputs. It offers the flexibility to use some of those outputs for a second and third zone, bi-amping your front speakers, or an extra set of Front speakers (Front B). Once you set up the power amp assignments, the receiver can handle the rest using its Intelligent Amp Assign. For instance, if you have a 9.2-channel system set up in the main zone and stereo speakers in Zone 2, the receiver automatically knows to switch the power amp from the “front presence” speakers in Zone 1 to the stereo speakers in Zone 2. Why would you want to do this? Let’s say you’re a music fanatic who values pure, stereo sound but also loves to watch movies in surround sound with your family. You could run YPAO for all the various seating positions in the room where people might sit while watching movies to get balanced sound throughout the room. 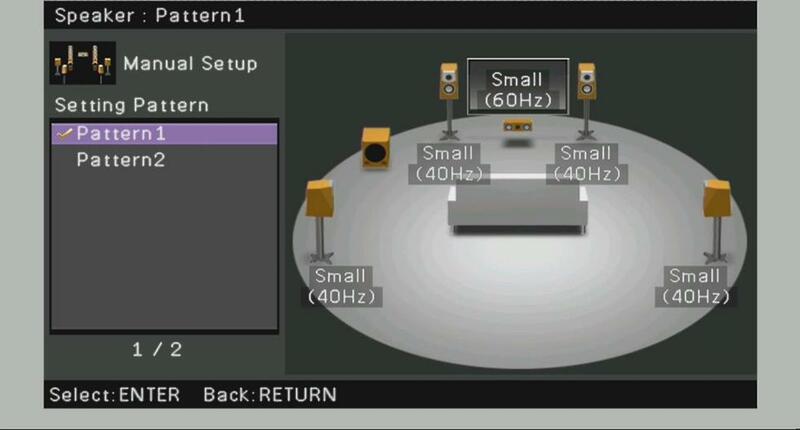 You can save that pattern as Pattern 1 for 5.1-channel surround sound. But for music, you want your speakers optimized your speakers for your favorite listening position — the “sweet spot” — equidistant from the right and left front speakers. Maybe you don’t want to use the subwoofer for music either. Turn off your sub, run YPAO again from this position, and your speakers will be optimized for sitting front and center. That’s your Pattern 2 for stereo music playback. You can easily recall these patterns using “Scene” modes. There are lots of connections you can make with the RX-A2020. But perhaps none offers more possibilities than an Ethernet cable to your home network router (or Yamaha’s wireless adapter for routers that are too far away for a wired connection). This not only opens up your listening choices to include Pandora®, Internet radio stations, and SiriusXM, but it also lets you use Yamaha’s A/V Controller app for your smartphone or tablet. 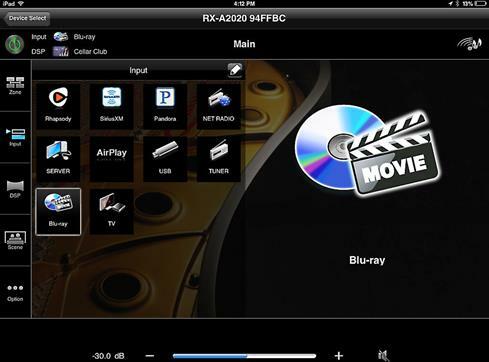 The RX-A2020 also has support for Apple AirPlay®. That means you can stream music wirelessly from iTunes® on your computer as well as from an iPhone® or iPad®. 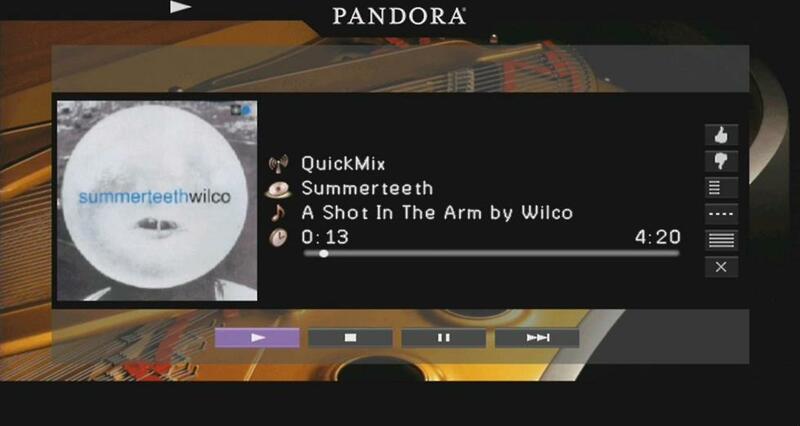 You can also stream tunes from Windows PCs and servers, thanks to DLNA compatibility. With my entire music collection digitized and residing in an iTunes library, I had instant access to tons of music, without ever having to pick up a CD. The RX-A2020’s on-screen display was in full bloom with streaming music. With both Pandora and AirPlay, the receiver pulled in album artwork as well as artist and title information to display on my TV. I was also able to use the receiver’s remote to control playback, even skipping songs in my iTunes queue. A networked receiver like this could relegate my CDs to storage. The Yamaha A/V Controller app (shown on an iPad) allows you to customize your inputs, so only your connected sources are shown with your preset icons and names. The easiest and most intuitive way to control the RX-A2020 is using Yamaha’s free A/V Controller app for your Apple® or Android™ device. I installed it on my iPad® as well as my iPod touch® and quickly lost interest in the factory remote. Just remember: the app only works if your receiver and controller are both connected to your home network. The app is most impressive when streaming music. Once you’ve set up your Pandora account (you’ll need the factory remote for this), the app pulls in all your stations so you can select tunes and see what’s playing. Same goes for Internet radio streams, as well as songs stored on your portable device or a music server. When I first opened the app and went to select an input for playback, I was a bit overwhelmed as every possible input showed up on my iPad. Fortunately, you can customize the inputs for a cleaner look. You can rename them and assign new icons using the receivers on-screen guide. Then open the app and de-select all unused inputs by touching and holding any input icon. Uncheck the unused ones from the display list (you can always put them back later on). Multi-zone playback can be a bit confusing for many customers, particularly when using a receiver’s factory remote. But when you have Yamaha’s remote app offering a graphical display, it’s far easier to manage. Because I had the receiver and Polk speakers set up in my living room, I was able to use my Definitive Technology DI 6.5 LCR in-wall speakers to test out Zone 2 capabilities. I hooked them up (my power amp assign setting was configured earlier for Zone 2 playback), grabbed my iPad, selected Zone 2 on the remote app, tapped the power button icon, and chose Pandora® Internet radio for my input. Suddenly, Otis Redding Radio was playing through my in-walls. I tapped on Zone 1, selected TV and started watching The Right Stuff on HBO in 5.1-channel surround through the Polk system while Otis Redding kept singing through the in-walls. This is the beauty of the Yamaha remote app. It makes it easy for anyone in Zone 2 to start playing music without having to fight over the remote with whoever is using it in Zone 1. Plus, the graphical nature of the remote app could make multi-zone audio easier and more appealing for new users. See what’s playing and control playback in all three zones with the Yamaha remote app. Zones 2 and 3 are limited to network, USB, tuner, and analog sources. Although the RX-A2020’s manual states that AirPlay can only be used in both zones simultaneously, that’s not exactly the case. 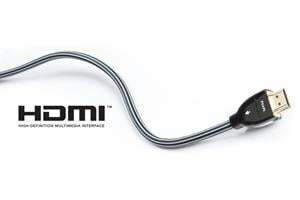 Our Yamaha sales rep gave us a tip recently. If you are watching a Blu-ray disc in Zone 1 and another person starts streaming via AirPlay in Zone 2, then Zone 1 is going to get hijacked and start AirPlay playback as well. However, if you start out playing AirPlay in Zone 2, with no source playing in Zone 1, you can then select any other source for playback in Zone 1. 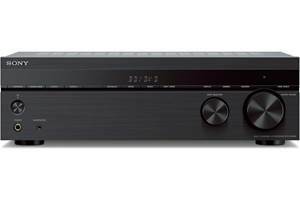 With a receiver as sophisticated as the RX-A2020, you can get pretty deep into the settings and options. So to keep everyday operation simple, Yamaha developed “Scene” modes, for controlling multiple components and recalling custom settings for various functions. Creating Scenes is as simple as implementing all your chosen settings and holding down the corresponding Scene button on the remote for a few seconds. Remember those speaker patterns I mentioned earlier? This is the easiest way to use them. For watching Blu-ray movies, I created a Scene preset using speaker pattern 1 for output to all five speakers and the sub. One press of the “Scene 1” button, and the receiver, Blu-ray player and TV all turned on, ready to start playing a disc in surround sound. 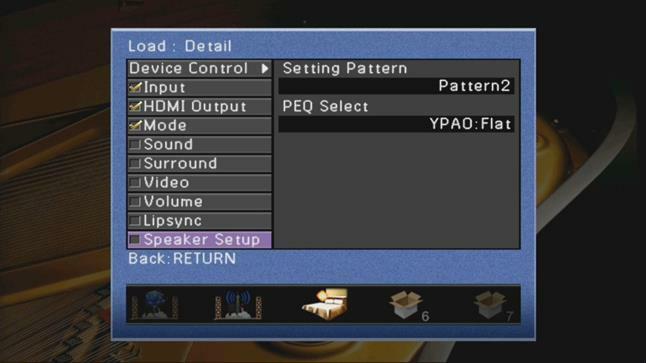 You can even choose a preset volume so you don’t accidentally blow out your eardrums or your speakers. "Scene" modes offer up to 12 customized playback and settings options for various usage scenarios such as movies, video games, or late-night watching. What about music? I created another Scene preset using speaker pattern 2 for stereo playback without the sub and Pandora as the source. So before I even walk in the living room, one touch of the remote app on my iPod touch can get my custom-made radio station playing in just a few seconds. 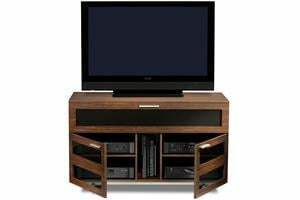 Another useful Scene would be for late-night TV watching, using only your front stereo speakers and no subwoofer. Customize it to implement Yamaha’s Dynamic Range Control, which keeps a consistent volume by limiting drastic shifts such as during commercials. You can even preset a higher dialogue level, so voices stand out clearer over sound effects and music. So, all receivers sound pretty much the same, right? I was fortunate to audition the RX-A2020 alongside the Yamaha RX-V575 receiver. I can report that while these two receivers have a similar tonal balance, they are far from being sonic equals. 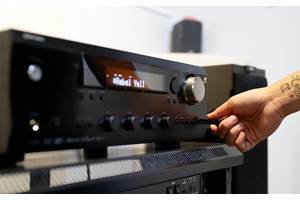 Both receivers use Burr-Brown digital-to-analog converters, but the A2020’s high-quality construction and beefier amplification (140 watts per channel vs. 80 watts per channel in stereo mode) made a significant difference in sound quality. I tried both receivers with the Polk TSi 300 floor-standing speakers, as well as my more familiar Definitive in-walls and my PSB Alpha B1 bookshelf speakers. The RX-A2020 consistently served up a larger soundstage, a more well-defined and larger center image, tighter bass, and smoother high frequencies. At first, I thought the RX-A2020’s bass response was a little lacking, but after more listening, I realized it was just more accurate and less boomy. On “Jimmy Jazz” from the Clash’s London Calling, Paul Simonon’s walking bassline sounded a tad bloated and loose with the RX-V575 in comparison to the RX-A2020, which tightened it up substantially. With the RX-V575, Steely Dan’s Aja sounded crisp and clean. But compared to the RX-A2020, cymbals just weren’t quite as shimmery, the bass just wasn’t quite as tight, and the snare just didn’t quite pop. Individually, these were subtle differences. But when you put them all together, it showed off the 'A2020's audio prowess that serious music lovers will appreciate. To see what the RX-A2020 could do with surround sound, I dusted off my DVD of Fight Club. There is one scene that is a favorite of mine for showing off what a home theater system can do. Edward Norton’s character is describing his miserable existence of non-stop business travel and insomnia. His voice-over dialogue was crystal clear and bold through the Polk TSi CS10 center channel (a trend that continually caught my ear with this receiver) while the Dust Brothers electronica soundtrack kept the TSi300 towers bumping. Suddenly, as the voiceover switched to dialogue on an airplane between Norton and a fellow passenger, there’s a mid-air collision between his plane and another. The impact of the collision shook my entire living room as every speaker suddenly came alive — especially the subwoofer. This is as close to theater-quality sound as I’ve heard with any system in my home. I watched this scene three more times just for the thrill of that impact. Overall, the RX-A2020 gave my music and movies more of a three-dimensional sound, making the RX-V575 sound a little flat by comparison. I am not looking forward to returning this receiver and going back to my seven-year-old Yamaha receiver with far less power and far fewer features. 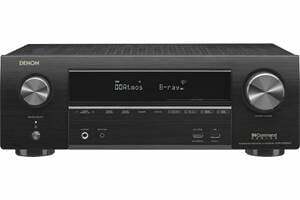 The Yamaha RX-A2020 is a beast of a receiver, and a significant upgrade over entry-level models like the RX-V575. With more connections, cool custom setup features, and multi-zone flexibility, there are a lot of possibilities. 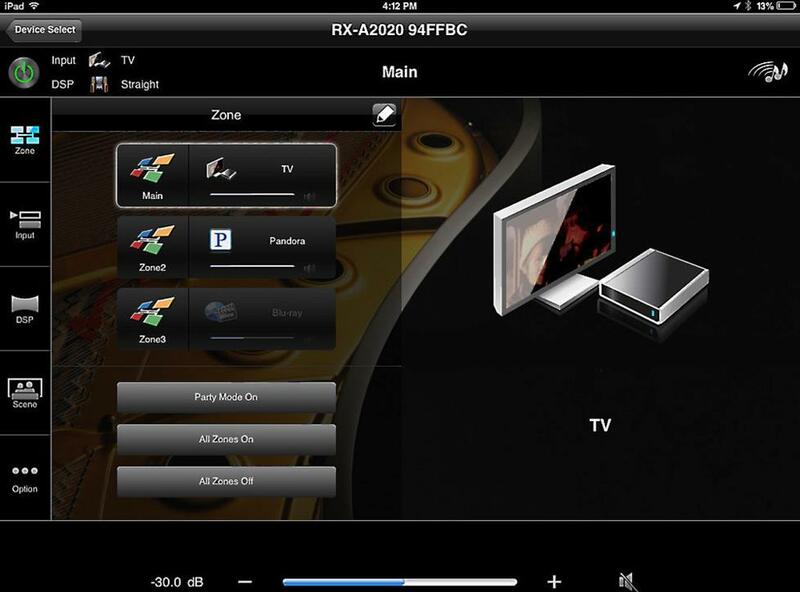 The Yamaha A/V controller app greatly improves the user experience over older receivers without network capability. And its powerful amplification will push your speakers to deliver a detailed, dynamic performance. 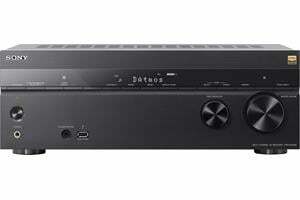 If you’ve been on the fence about upgrading your receiver, the RX-A2020 is a worthwhile choice to get much more out of your music and movies. Thanks, I am ordering one today based on your review. Concise and easy to read review.